Pretty Me Up! 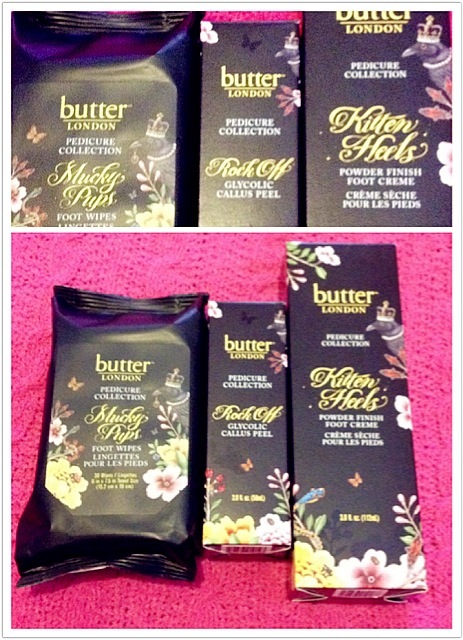 : butter LONDON Review and Feature! 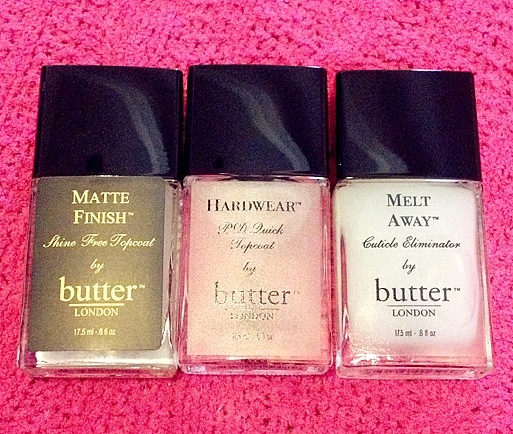 butter LONDON Review and Feature! This is my first time playing with Butter London products, and my verdict is that I am throughly impressed! 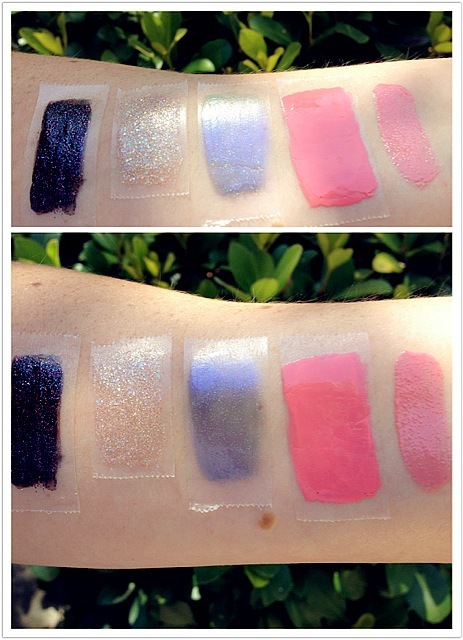 Such high quality, high pigmentation, beautiful colors and unique products! Some stand out items are Melt Away Cuticle Eliminator, Mucky Pups Foot Wipes, Rock Off Glycolic Callus Peel, Trout Pout Polish and Lippy. Keep reading and you'll see why I'm so in love with butter LONDON! 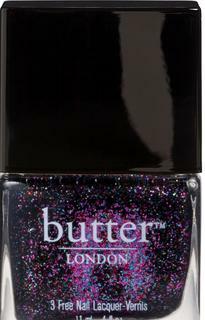 By transforming catwalk trends to custom nail colour palettes, butter LONDON has developed a passionate following. butter LONDON is the cult phenomenon of the nail industry and is fast becoming famous for our high fashion, 3 Free (non-toxic) nail lacquers and revolutionary waterless nail services. butter LONDON products are formulated without the use of the harmful ingredients like Formaldehyde, Toluene, DBP or Parabens. 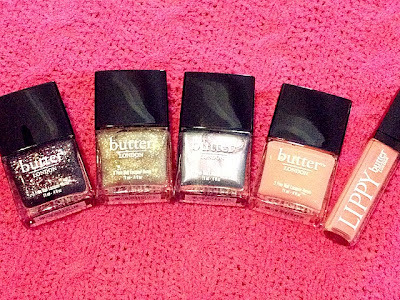 butter LONDON was the first company to sell non-toxic nail lacquer in the United States. 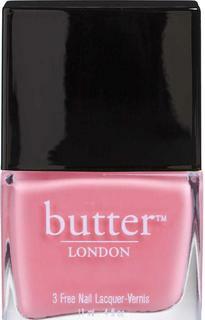 butter LONDON, has been a backstage fixture at Fashion Week since the beginning. 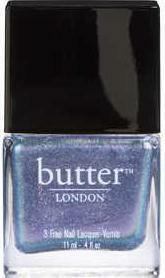 We have longstanding relationships with designers who love butter LONDON for the authenticity of the experience. Our specially trained team of manicurists and the designers sit together, discuss the designer’s muse, look at the collection, and arrive at a bespoke colour just for them. Nails are a fashion accessory and can have a huge impact on an outfit, so getting them right is crucial. It’s a unique process, and ensures that the designers have creative input and control over their catwalk beauty look, which is incredibly important. butter LONDON’s fashionable friends include designers like Alexander Wang, Victoria Beckham, Betsey Johnson, Vena Cava, Calvin Klein, Issa, and many more. butter LONDON is honoured and delighted to be a part of their world, and they help to ensure that butter LONDON customers receive genuine, high fashion colours. butter LONDON was founded in 2005 by British entrepreneur, Sasha Muir, who saw a gap in the marketplace for luxurious yet affordable nail services and high quality products. To help her realize this vision, Sasha asked industry veteran Nonie Creme, London’s premier fashion manicurist, to partner with her as butter LONDON’s Founding Creative Director. With years of experience, Creme’s colour expertise was quickly put to use in the development of a unique, cutting edge and high fashion collection of lacquers and products. Muir now serves on the Board of Directors. Our talented Product Development team continues to be at the forefront of formulation and design with imaginative techniques, bold graphics, and audacious cheeky humor. Leslie Freytag now serves as President and CEO. The Black Knight A dark dazzler from butter LONDON, this glitter fusion lacquer contains black, pink, blue, and silver suspended in a black base. 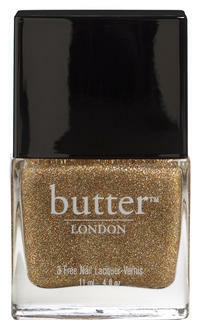 West End Wonderland Be one of the Glitterati in classic gold glitter varnish. It’s Anabel’s, the Groucho, and The Electric all rolled into one magnificent lacquer. 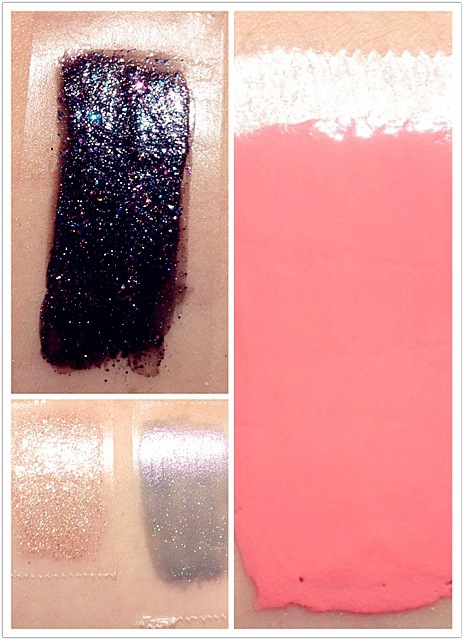 Knackered A sheer, twinkling oyster shade flecked with micro glitter particles. Trout Pout An opaque shade of cantaloupe, a pale and retro lacquer. Swatched on the end is Trout Pout Lippy (same shade as the polish). This gloss is rich and densely pigmented. I love it! Create a new look for every lacquer using this shine free topcoat. Turns any colour matte, flat, and utterly beautiful. This topcoat is the #1 Fashion Week essential. A great topcoat is a necessity for longer lasting manicures. Hardwear protects the layers of colour beneath it, and gives a super-shiny finish. Nails look wet, vibrant, and freshly painted even when they are dry. Of course it’s also 3 Free, like all our products. In case you were wondering, P.D. Quick stands for ‘Pretty Darn Quick’! By using Melt Away weekly, you can literally ‘TRAIN’ your cuticles to behave! Gentle cuticle exfoliation will gradually decrease cuticle size and hardness, until they are constantly thin, soft, and easy to deal with. 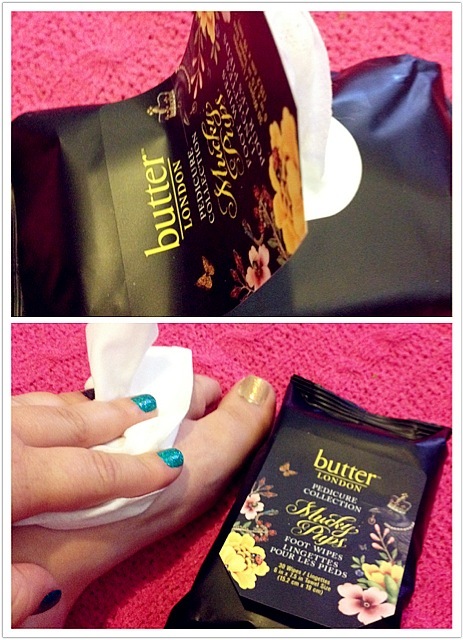 This collection is amazing and a must have if you do your own pedicures. 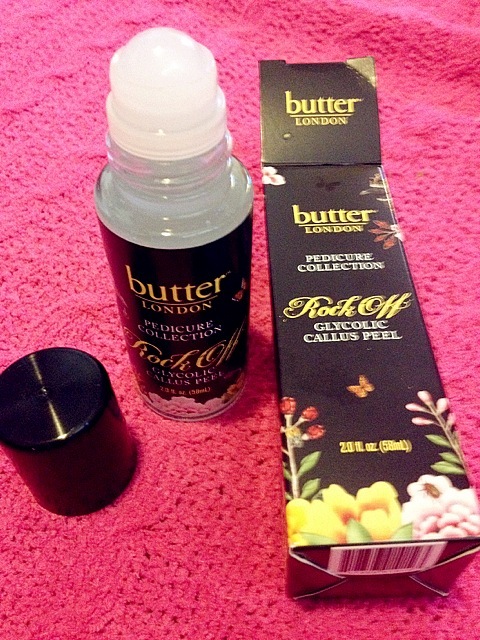 I do my own pedicures to save money and I have everything I need now thanks to butter LONDON! Hard skin simply melts away! Directions: Shake well and roll over hard skin areas until wet. Wait 3-5 minutes, and then using a foot file, file treated area. Hard skin simply melts away! Wipe treated area thoroughly, after use, with ourMUCKY PUPS, Foot Wipes. 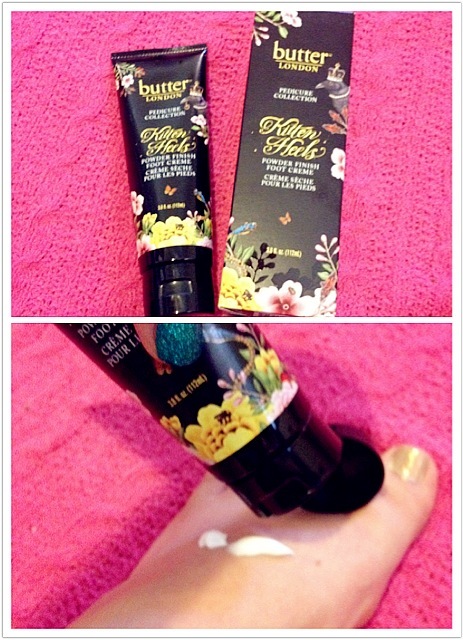 Kitten Heels, our miraculous Powder Finish Foot Creme, instantly hydrates, yet leaves a soft, powder finish to help keep your feet dry and silky. You may never wear socks again! 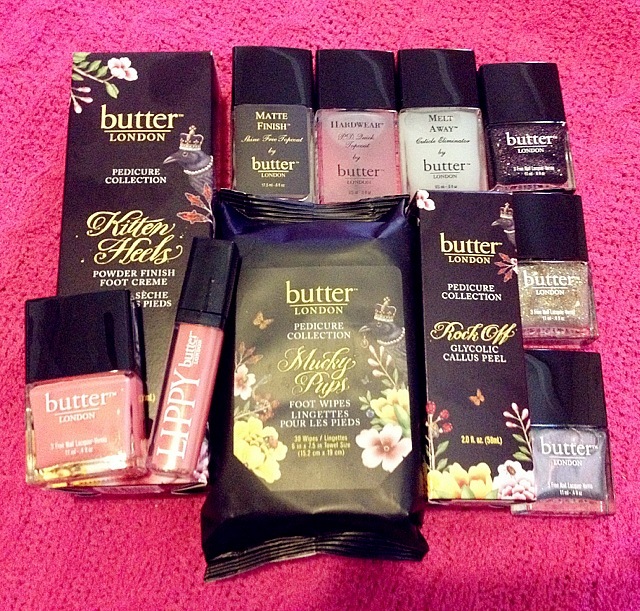 butter LONDON products were provided to Pretty Me Up, free-of-charge for review and feature.